Ford Ranger Pilots Tomas Ourednicek and David Kripal from the Czech Republic didn’t had an easy start in the 40th edition of Dakar Rally: They lost time in the first special due to technical problems. Currently they occupy the 61st position. 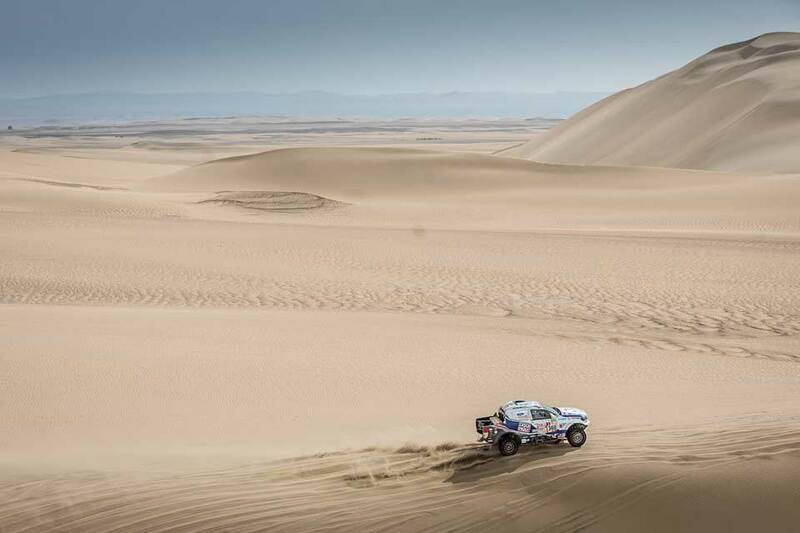 After the start ceremony in Lima, the teams headed to the 272 km long first stage to Pisco, that included 31 kilometers against the clock. Although the timed section was short, it didn’t mean it was easy, surprisingly many teams had problems right in the opening special. Unfortunately, the crew was one of those: After a promising start, they lost time due to technical problem on their Ford Ranger Dakar. "Today was a real nightmare," said Ourednicek. "It all started well, we overtook three cars and were in the process of passing a fourth one when, all of a sudden, the car began to lose power and we got stuck. We managed to continue but the problem persisted, so we got stuck three more times, and we also missed a waypoint. Altogether we lost some time, but if we consider how long way is still in front of us, it’s not critical. Now the ost important is to find and overcome the problem, and get ready for the next day, the Czech stated. "The atmosphere in Lima, at the start ceremony was fantastic! Many people, all friendly and smiling… Today’s route, the dunes and the organisation was really great, but unfortunately we had problems and missed a waypoint so we couldn’t make the result we hoped for, but the race is long, I hope we can improve tomorrow," David Kripal added.